Pressure cook toor dhal with turmeric , mash well and keep aside. Extract pulp from the tamarind. Cut vegetables into big pieces. Slit green chillies. In a pan, heat a teaspoon of oil and add the items (given in the list" To Powder") till golden brown. When cool, add coconut and powder coarsely in a mixie. Keep aside. In the same pan, heat the remaining oil , add mustard seeds , slit green chillies and curry leaves. Then add all the vegetables and stir fry for 2 minutes. Add required amount of salt, pour in 1/4 cup of water and cover it with a lid. When half done add the tamarind extract and let it boil till the raw smell of the tamarind goes. Now add the mashed dhal and let it boil for 3 more minutes. Add the ground powder and bring it to a boil. 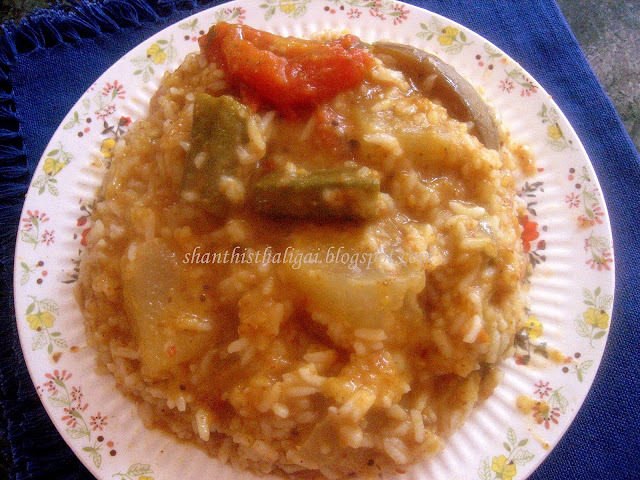 Mash cooked rice, and add it to the sambhar , mix well without any lumps and serve hot with any vadaam or poricha appalam. I have taken kadamba sadham several times but never prepared at home. Thanks for your wonderful recipe. I will definitely try it out. Looks delicious. wow, this looks like bisi bele rice..great recipe. The name itself maked me hungry... The dish looks very inviting and yummy!!! OH I have eaten it at the temples, I did not know it was called Kadamba Saadham. It tastes superb..and its healthy with all the vegetables and Tuvar Dhal. I used to think it was sambar rice.Thanks for the recipe. Perfect comfort food with appalam or vethal! Very nice Maami! Such a comforting food..can eat them anytime..
delicious kadamba sadam, my favourite. posting all the recipes which are comfort food of Iyengars.Pls post porulvilangaa Urandai too. As i need the measures. I did not know it was offered in temples! How could I miss it??? Can just finish your plate in a jiffy. Once i tasted this in Tirumala.Delicious rice.